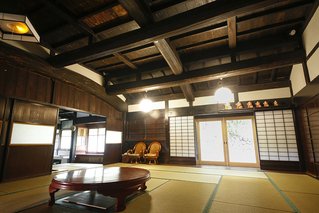 Rooms are full of charm and authentic Japanese décor. Spacious bathing area with forest view. Private use possible with advanced reservations. 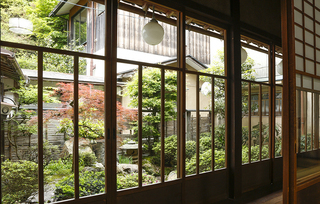 Walk through the several small ornate Japanese gardens within the ryokan itself. Private Japanese style cottage sleeps 2-10people. 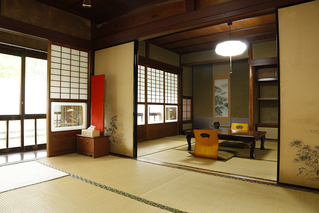 Ryokans typically have many small guest rooms, but at Kigusuriya multiple rooms have been consolidated to create three extremely comfortable and spacious (roughly 30 square metres) suites, each with their own toilet facilities. 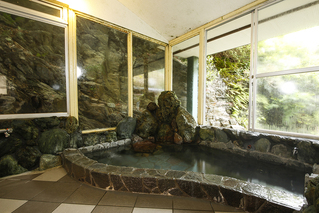 Full of charm and authentic Japanese decor, each of the rooms is connected to the dining and communal bathing area via an array of quaint stairways and passages. Overlooking the forest, the spacious bathing area is very pleasant and if you contact them in advance, you can book a completely private bathing time for your group or family. There are men and women segregated public baths. 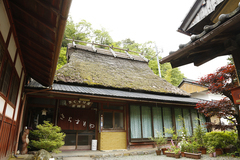 Kigusuriya offers hiking tours, bicycle tours and kimono with green tea cultural activity. Kigusuriya will come and pick you up from Sonobe JR train station by car as part of their service. Take the train to Sonobe JR from Kyoto JR which takes 46 minutes (or 30 by express). A member of staff will pick you up and transport you to your accommodation via shuttle bus (50 minutes’ drive). In order to have a shuttle waiting when you arrive please let us know your rough arrival time as soon as possible (at least several days in advance). Once you arrive in Sonobe JR please wait just outside the turnstile. Many customers choose to rent a car, as the roads here in Miyama are largely free of traffic and quite easy to drive on. This also gives you the freedom to move around the area at will during your stay. Kigusuriya is located about 60 kilometres from Kyoto station. By car it takes about 1 hour and 40 minutes.